Daimler has extended its portfolio of new energy vehicles (NEV) with the introduction of the Denza 400, the company’s “Made in China, for China” electric vehicle from Shenzhen BYD Daimler New Technology. The Denza 400 (below) offers upgraded battery, electric motor and electronic control providing customers an electric range of up to 400 km on a full charge. The vehicles are manufactured at BDNT’s independent production line at the BYD base in Shenzhen. The new flexible production line will increase capacity based on future market demand. The current SOP – start of production – of another NEV project is a signal, claims Daimler, of its “comprehensive approach in the area of electric mobility”. “Our joint venture BDNT unites the best of Sino-German cooperation in new energy vehicles. 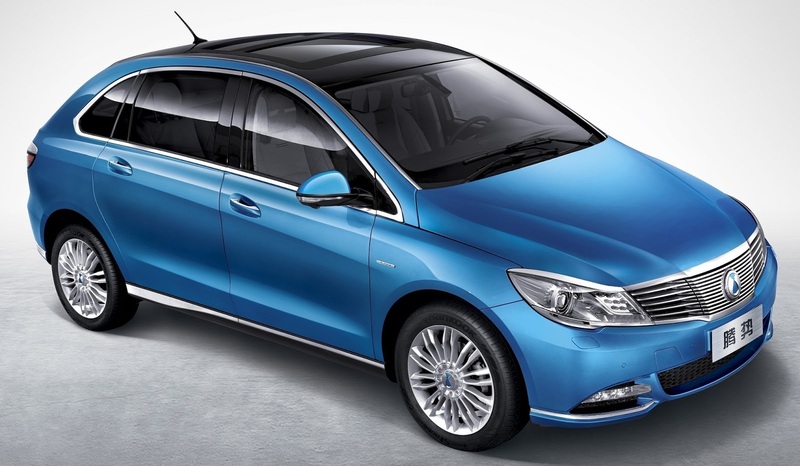 Already offering safe, reliable and convenient electric vehicles from and for China, the Denza 400 with upgraded range offers our Chinese customers a further improved driving experience,” claims Hubertus Troska, member of the board of management of Daimler AG responsible for Greater China. In addition to electric vehicles, Daimler’s strategy in China to “reduce emissions” and “promote environmental responsibility” includes an increasing offering of plug-in hybrid vehicles. In 2013, Mercedes-Benz says it was the first automaker to offer petrol, diesel and hybrid models at the same time in China. The E 400 L Hybrid was the first locally-produced hybrid from a premium brand, while the smart electric drive (electric power consumption combined 15.1 kWh/100km/ CO2 emissions combined 0g/km) was the first imported premium all-electric vehicle from Europe. The Denza 400 features improved battery density achieved through an “upgraded production process” that increases battery’s capacity from 47.5 kWh to 62 kWh while maintaining the original size. With an upgraded range of up to 400 km, most Chinese consumers, who generally drive 50 to 80 km per day, will need only to recharge their Dwnza 400 once per week. The appearance of the latest model suggests shortcomings for the original design. BDNT launched firstgeneration Denza in 2014 as the premiere offering from the first Sino-German joint venture dedicated to electric vehicles in China. With nearly 3,000 units sold in its first year in 2015, Daimler says Denza became the choice for those seeking convenient and reliable emission-free mobility. BYD will no doubt be pleased to have the strength of a European technology and manufacturing giant as a shoulder to lean as it progresses its battery technology into road vehicles. BYD Daimler New Technology Co., Ltd. (BDNT) in Shenzhen is the first Sino-German joint venture dedicated to an all-electric vehicle in and for China. It targets raising the bar in the domestic electric vehicle market by combining Daimler’s engineering expertise as global forerunner in safety and quality with BYD’s battery technology – technology that will be extended to a range of different-sized vehicles. BDNT will continue to focus on the development of energy-saving, safe, comfortable and high quality electric cars. Partners in BDNT claim the joint venture is “committed to become China’s most successful new energy automobile manufacturer, to promote new energy vehicle (NEV) development and to create a better living environment”. Daimler Greater China Ltd. (DGRC), established in Beijing in January 2001, is responsible for the operation of Mercedes-Benz Cars, Mercedes-Benz Vans, Daimler Trucks and Buses, Daimler Financial Services, and Daimler Spare Parts in Mainland China, as well as Hong Kong and Taiwan. In China, including Hong Kong, the largest single market worldwide for Mercedes-Benz, the company saw sales rise by 33% to around 220,000 units in the first half of 2016. Daimler’s latest investment in China is a €500 million commitment in expanding its engine plant at Beijing Benz Automotive Co., Ltd. (BBAC).